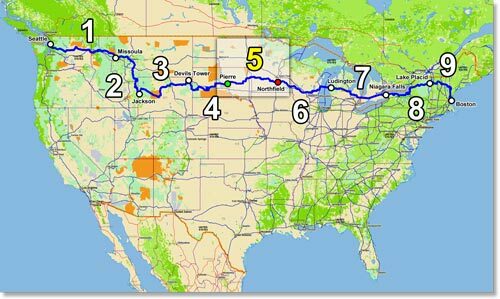 This tour takes you from Pierre, South Dakota, on the Missouri River, to Northfield, Minnesota on the Cannon. Water is a recurring theme as you cross the streams and rivers of eastern South Dakota's open prairie and enter the lake-covered woodlands of Minnesota, the "Land of 10,000 Lakes." Outside Minneapolis and St. Paul, you will enjoy riding beautiful lakeshore paths on one of America's finest bicycle trail networks. The tour ends in the small Midwest town of Northfield, where locals foiled a Jesse James Gang robbery, forcing Jesse James into retirement from his life of crime. You won't want to linger too long, though, or you'll miss the next segment, through the beautiful rolling countryside of Wisconsin.